Itï¿½s a generally understood fact of language learning that if you want something done right, especially flashcards, you need to do them yourself. Making flashcards not only guarantees you get something that matches your learning style, the very act of making them also aids retention. Unfortunately, making flashcards requires lots of time, paper cards attached to rings, regular pens, brush pens, language textbooks, patience and unlimited drive and focus. 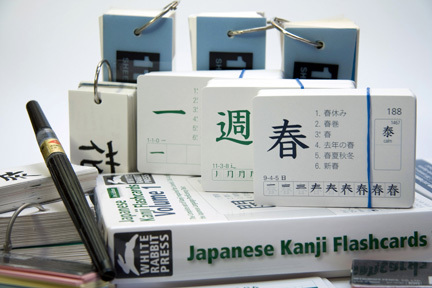 By contrast, the Japanese Kanji Flashcards from White Rabbit Press are, by far, among the best Japanese study materials available on the market. They are well thought out and pack a great deal of useful information on each card. One side includes the kanji character, stroke order, and samples of the kanji in six different word and phrase compounds and look-alike kanji that have an annoying tendency to appear on the JLPTs. Each compound is cross-referenced to the Japanese Language Proficiency Test in which it appears. The other side includes the characterï¿½s on and kun readings and its definition, along with the pronunciations and definitions of the sample compounds. All pronunciations are in hiragana, which also helps learners improve their reading skills. If youï¿½ve already spent money on a kanji textbook, the White Rabbit Press website includes dozens of downloads that cross-reference the cards with popular kanji textbooks including the Basic Kanji, Nakama and Genki books. Beginners, people studying for one of the four JLP tests and even long-term studiers with no interest in level tests will find White Rabbit kanji flashcards to be useful resources. No set of cards on the market serve so many purposes in such a well organized package. They are well worth money and will save you hours upon hours of work and swearing. Copyright © 2002-2008, Dwayne Lively. All Rights Reserved.